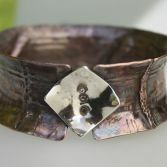 This lovely Fold Formed Copper & Silver Square Bangle is made predominantly of Copper but has a sterling silver square detail added giving it a contemporary look. 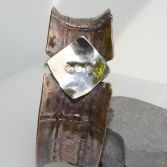 The Bangle is a one of a kind item and has been handcrafted by me. A similar Bangle can be made to order but no two Bangles would be exactly the same due to the handmade nature of this item. However the images shown are a good representation of the Bangle you would receive. 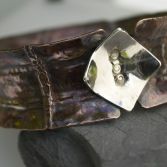 The bangle's band is approximately 3.8cm wide and the size of this bangle is a medium 6.5cm diameter. Other sizes can be ordered please use drop down option to select size please allow 4-5 days from date of ordering. To give the Bangle is lovely coolers a patina has been added to the polished Copper, to keep your bangle looking great polish before wearing with a silver polishing cloth (works great on Copper) The Bangle has an anti-clastic curve so is very comfortable to get on and off and to wear. Copper has a beautiful warm quality and is renowned for it's healing ability often worn to alleviate symptoms of arthritis. 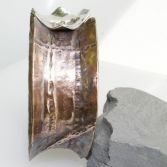 Your Fold Formed Copper & Silver Square Bangle will be presented in a black gift box and posted via 1st class Royal Mail recorded delivery (signed for) to any UK address free of charge.